Blurb This was an early floppy disk interface for the ZX81, later also for Spectrum. 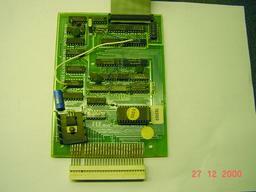 It had its own DOS on board in EPROM, featuring 10 commands for Load, Save etc. to a 40 track single sided 5.25" floppy disk. The Spectrum version was housed in a small metal box. The magnetic tracks on a floppy were used as if they were cassette tapes, each could hold a program. The loading/saving synchronized on the index pulse and had to be done and over before the next index pulse arrived. Apparently over 65,000 x 8 data bits could be shifted in and out during one revolution of the disk, which takes 0.2 sec. !